This article is our ongoing series on Linux Auditing, in our last two articles we have explained how to install and audit Linux systems (CentOS and RHEL) and how to query logs using ausearch utility. In this third part, we will explain how to generate reports from audit log files using aureport utility in CentOS and RHEL based Linux distributions. 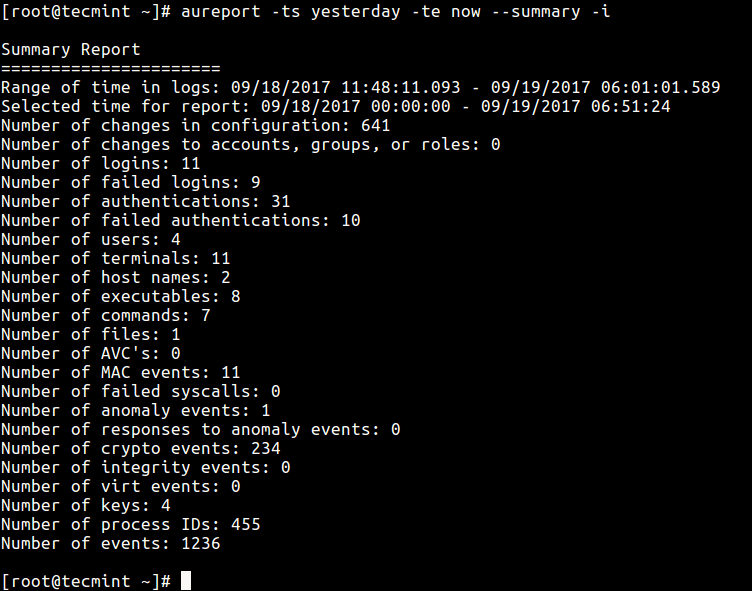 aureport is a command line utility used for creating useful summary reports from the audit log files stored in /var/log/audit/. Like ausearch, it also accepts raw log data from stdin. It is an easy-to-use utility; simply pass an option for a specific kind of report that you need, as shown in the examples below. The aurepot command will produce a report about all keys you specified in audit rules, using the -k flag. You can enable interpreting of numeric entities into text (for example convert UID to account name) using the -i option. If you need a report about all events relating to attempted authentications for all users, use the -au option. The -l option tells aureport to generate a report of all logins as follows. The following command shows how to report all failed events. It is also possible to generate reports for a specified period of time; the -ts defines the start date/time and -te sets a end date/time. You can also use words like now, recent, today, yesterday, this-week, week-ago, this-month, this-year instead of actual time formats. If you want to create a report from a different file other than the default log files in /var/log/audit directory, use the -if flag to specify the file. This command reports all logins recorded in /var/log/tecmint/hosts/node1.log. You can find all options and more information in the aureport man page. 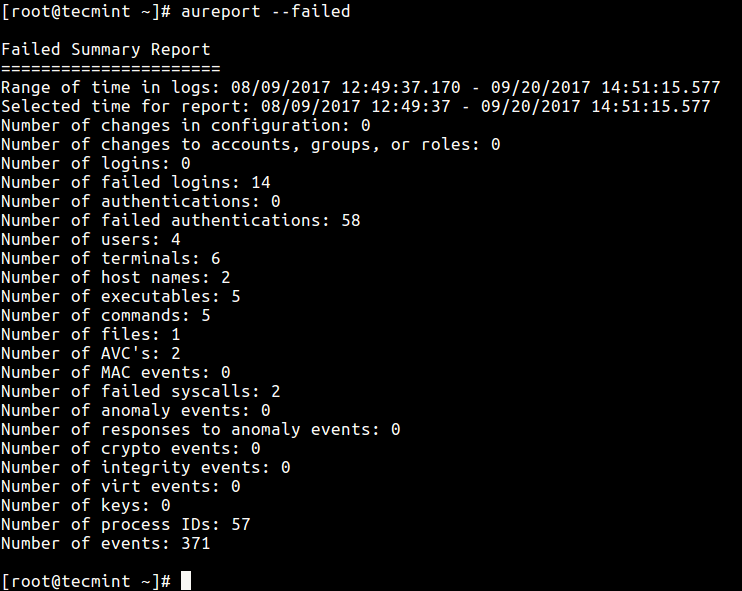 In this tutorial, we showed how to generate summary reports from audit log files in RHEL/CentOS/Fedora. Use the comment section below to ask any questions or share any thoughts concerning this guide. Next, we’ll show how to audit a specific process using ‘autrace’ utility, until then, keep locked to Tecmint.